Lounge apparel retailer FlyPolar uses a new service from vendor Sentient Technologies to test many elements quickly across multiple pages and is on track to double sales this month. Artificial intelligence can lead to real sales increases—and fast ones, too. Just ask loungewear retailer ShopFlyPolar.com. The web only merchant had hit a sales downturn, generating about $277,000 in web sales in February 2015 to about $50,000 in July 2016 says, says Shawn Broadus founder and CEO of FlyPolar. “We hit a slump,” Broadus say. “The seasons changed and our conversion rates dropped.” Broadus reached out to Condorly LLC, a vendor among a growing breed of service providers that sell conversion rate optimization services—which essentially figure out ways to get more shoppers to purchase. To boost conversions, Condorly CEO Peter Brown and Broadus turned to new user testing software from San Francisco-based Sentient Technologies that uses artificial intelligence to enable companies to test nearly an unlimited number elements across multiple pages at once to determine the arrangement that works best. Artificial intelligence is when a program learns over time when it’s exposed to new data instead of being explicitly programmed by an individual. The AI-based software, called Sentient Ascend, debuted publicly Wednesday but is already being used by about 10 mainly e-commerce companies, says Jon Epstein, chief marketing officer for Sentient. Since implementing the AI software with ShopFlyPolar.com approximately 30 days ago, average order value has increased about 13% and the retailer has experienced a 16% increase in site visitors initiating the checkout process. Additionally, FlyPolar is on track to generate $100,000 in sales this month, about double its July sales, Broadus says. Since using the service, the conversion rate has climbed to as high as 1.84% compared with this year’s previous high of 0.89%, he says. The big difference between Sentient Ascend and traditional user testing services is Sentient’s ability to simultaneously test multiple moving parts. The standard testing method most retailers use is A/B testing, designing two versions of the same page, showing them to users, and collecting statistics on how well each version converts, Sentient writes in a blog post announcing the Ascend product. This method incorporates human knowledge or hypothesis about what design tweaks will improve performance and then tests the effects. After observing the results, new designs can be compared and gradually improved. However, with A/B testing, only a fraction of page designs can be tested in this way, and subtle interactions in the design—how a light green Add To Cart button, for example, performs when paired with a particular font size and style—may be missed completely. The Ascend AI-based software automatically generates web pages to be tested based on the goals and ideas marketers input. For example, a retailer might enter a goal of higher average order value and then input the various ideas on page tweaks to reach that goal. The variables can be anything on a site, Sentient says, from such small changes as button color and font weight to entirely revamped messaging and design ideas. The variables to be tested also may be on a single page or across multiple pages of a website—something Sentient says is not possible to do with other tools on the market. The software then searches for the most successful ideas across the massive amount of possible combinations its users want to try. As Ascend tests and observes results, it learns and starts to evolve combinations of the design variations. During the testing process, it directs traffic to the best-performing design. The result is being able to test thousands of page designs in a short time, which isn’t possible with traditional A/B testing, Sentient says. Learn more details about how Ascend AI works here. FlyPolar also focused heavily on product pages. 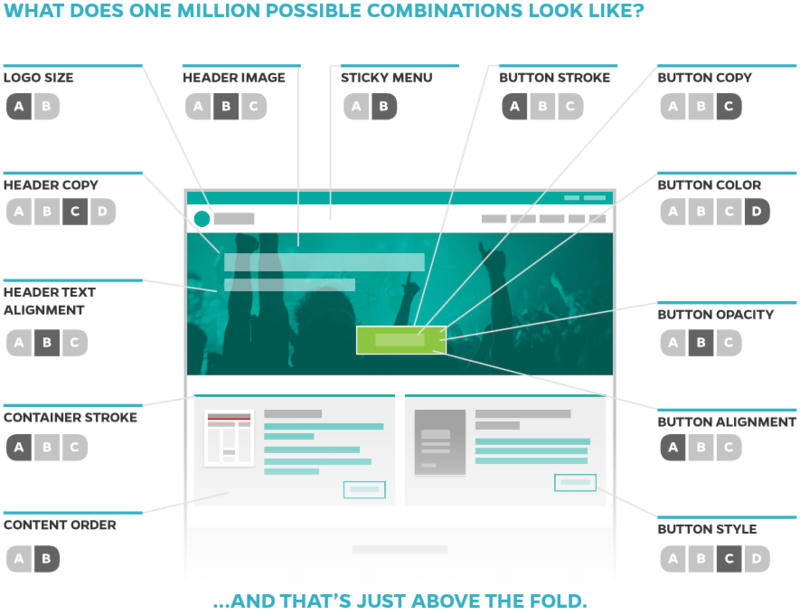 On those pages a simple move like putting the Buy button above the fold helped pages perform better. Sentient’s Epstein says the software’s big benefit is being able to test combinations of many elements on one page. For example, in tests with a large U.S. mobile phone retailer, which Epstein declines to name, the merchant wanted to test an unusual salmon hue for the Add To Cart button. “While that individual change alone did not improve results, when it was coupled with a specific size and type of font, the salmon-colored button was the best-performing variation of the page,” he says. Sentient Technologies launched about nine years ago but operated under the radar until about 2014, Epstein says. In addition to Sentient Ascent, Sentient Technologies operates a product recommendation engine called Sentient Aware and Sentient Investment Management, a hedge fund business that uses the same AI technology as Sentient Ascend. Beyond FlyPolar, lingerie retailer Cosabella.com also uses Sentient Ascend.